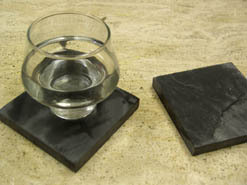 The beverage coasters listed below are all made entirely from natural stone materials. 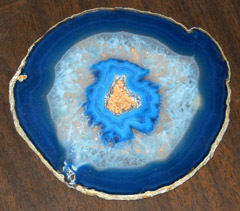 the colors and patterns found in the surface of these pieces occur naturally, during the formation of the stone, and have not been enhanced by humans in any way whatsoever. 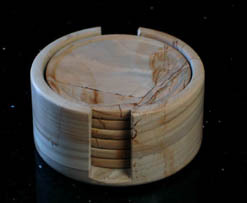 The surface of these sandstone beverage coasters is made up entirely of natural features, ancient fossils, implanted in the stone by the environment, and not enhanced or added to by human hands in any way. 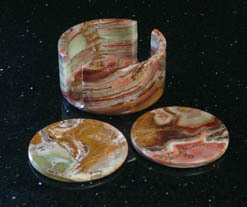 Panther sandstone coasters are like visions of a color painted dessert. 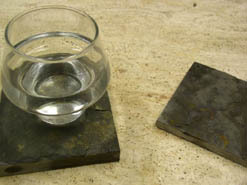 They have a softly graded surface which is flat, yet textured, to ensure that a glass wont fall of. 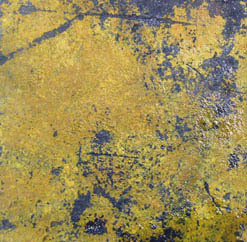 This surface is also enhanced, naturally, by a thousand pin points of color, which merge within the surface to create a unique vision of contrasted hues which is overwhelming in a subtly beautiful way. Powerful swathes of color slide across the face of these coasters, forming unique bands of pattern which contend with one another, even as they merge and compliment one anothers luminous hues. Happy, even playful, the colors seem to dance in tune, each aligning itself around the others in a perfect harmony, that bellies the struggle for visual dominance which is the hallmark of these pieces. 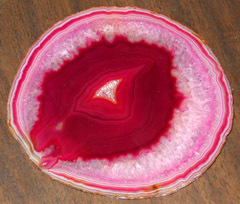 Ruby sandstone beverage coasters are made from a highly absorbent natural material. When dry, the surface of these pieces is a soft array of gently merging red tones, sort of like a hazy crimson cloud that floats lazily just beneath the surface of the stone. However let a single drop of moisture hit the stone, and penetrate its million pores, and suddenly you will see the material light up with bright, brilliant red tones that are overwhelming, even as they are temporary. Subtlety thy name is moondyne, a subdued stone, content to stand back and let others be admired. 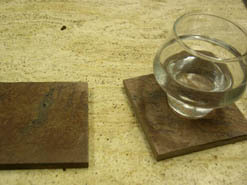 And yet when its time to step up and stand between a wet sweaty glass and your delicate surfaces, the moondyne coasters are always there, highly absorbent, and ready to take one for the team. A thousand shades of gold and tan alight upon the face of this coaster, creating unqiue eddies and swirls, forming patterns which are infinitely complex, and yet as simple as the earth itself. 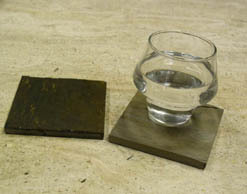 Solid, dependable, powerful, copper stone beverage coasters are some of the most impressive pieces of home decor that can be purchased anywhere. While all of our natural stone bevereage coasters are taken from the earth, quarried from the great mountain ranges of the world and then refined into the lovely home accessories listed here, only the earth select coasters truly embody the vision of what the word "earth" brings to mind. 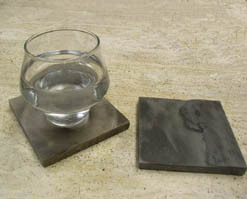 These attractive coasters, cast in a variety iof greys and browns, with gentle red streaks running through the surface, are an archetype of stone, the ideal of what rock should look like. Subtle shades of green gray tones alight upon one another, bathed by a soft pervasive golden light, which seeks to illuminate the entire vision, casting it in a pleasant mist, that heightens the overall beauty of each piece. 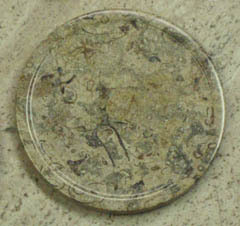 This recombination of tone and color is unique to each coaster, making every individual within a set of four, six, or eight, a one of a kind vision, that is unlike any other in the entire world. Multicolored midnight tones shift and swirl within one another, like a series of charcoal clouds, forming and reforming, darkening and lightening, to create a stunning vision across the surface of each indidvidual slate beverage coaster. Powerful golden explosions light up an inky black backdrop, setting fire to what is an otherwise subdued and reserved stone. These powerful explosions rip through the surface, casting yellow and golden, crimson and amber light randomly in patterns that are powerful and impressive. 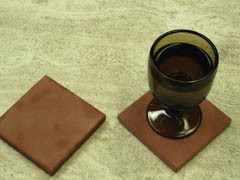 The contrast of the piece, deep and abiding, gives the coasters a sense of strength and energy, that is missing from other more subdued items. This power is enhanced by the fact that the pieces are solid stone, mountain born, and intrinsically connected to the earth because of it. Green gray tones merge and swirl in a subdued back drop that looks like any stone you would find on the side of the road. However this subtle background is broken when bright bolts of color emerege, seemingly from inside of the coaster itself, bursting forth to the world of light to lay reds and golds and amber hues atop the otherwise casual surface of these attractive coasters. Red earth coasters are a wash of crimson tones, mixed with maber oranges, and lightly fading hues of gold, all mixed together to form a series of coasters which are powerful and dignified. This dignity casts a certain elegance over the piece, demanding attention, and yet contenting itself to hold back, and let the subtle shades rest upon the face of the stone. 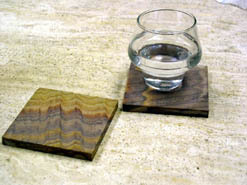 If you stare into the surface of these all natural sandstone coasters, you will start to see visions. Landscapes will emerge from the random lines, strange shapes, a picture of a far off worlds that may never have existed, or are only yet to exist. As your eyes trace the graceful lines, the dip and play of contrast and shadow, you will be able to make out horizon lines, or subtle pathways, or the gentle gait of hills rolling in the distance. These coasters have a serious demeanor, the strong yet dark colors found within their face, casting a stern presence over everything surrounding them. Yet this strict feel is still broken, though slightly, by the almost playful lines that slip and dive amongst the colors of the surface of the stone, providing a strange sense of whimsy that belies the otherwise overbearing manner of the pieces. Subtle bands, painted in a million colors, stretch lazily across the surface of these coasters. Each one arcing like a subdued rainbow, set against a hazy dust storm, which serves to cast the entire vision in a hazy dream like state. The result is that these coasters are very soft, and light, and can easily fit into just about any decorative setting, acclimating easily to their surroundings, while still adding to the overall beauty of the space. 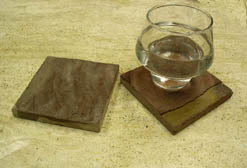 The natural US sandstone drink coasters are some of our most subdued and subtle pieces. Soft tan tones are broken by a sea of specks, which alight randomly, and yet fairly evenly, across the face of the stone. 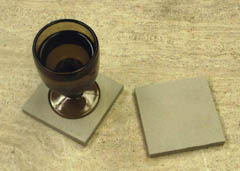 Made from the highest quality American sandstone, these coasters will esily absorb the moisture from even the wetest glass. Onyx stone is an intense material, with thousands of multicolored tones emerging and diving dimensionally through the stone, appearing on the surface at random, only to dissapear beneath another tone. These colors are all formed naturally, the result of a plethora of elements that were present during the creation of the material. This natural formation ensures that each and every piece is a one of a kind masterpiece, that is perfect for your decorative environment. 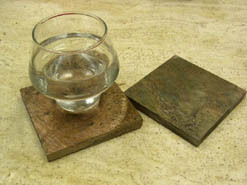 Fossil stone drink coasters. These million year old pieces are an actual part of the earths geological history. That is because when you look closely, and sometimes not so closely, you can see actual fossilized dendritic imprints in the surface of the marble. These are visions of plants, leaves, tiny animals, and shells which were trapped within the stone eons ago, locked there just waiting for the material to be found, quarried, refined, and polished into the attractive beverage coasters that are now available to you. 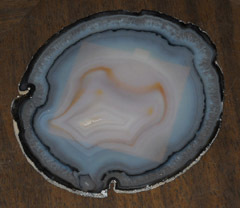 A subdued backdrop is the mainstay of these elegant marble coasters, however this tan perfection is broken, when streaks of color appear stretching across the face of the stone. Tiny and delicate, these lines almsot look like they were penned by a master artist, yet these brush strokes are not the work of any human, but are instead the craft of nature itself. 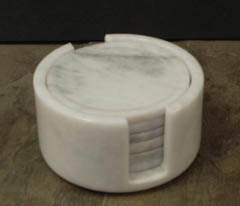 Beautiful fluffy white tones dominate these coasters, yet the gentle perfection of their surface is broken by the soft whisps of grey smoke, which translucently float across the face of the piece, providing relief from the unbroken monotony that is the otherwise brilliant perfection of these elegant polished marble pieces. The red lightning coaster sets are some of our most vibrant and visible pieces. 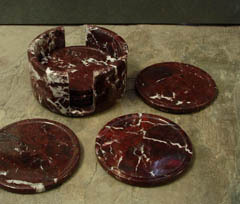 Bathed in a rich crimson, that is deepened by the polished perfection of the marble, and then broken by brilliant arcs of white lightning, these functional accessories tend to stick out in the home. Power accessories, these coasters would even be useful in an excutive office where it is important to show energy and strength to all who enter. A thousand shades of green slowly merge into one another, until the final vision is of a slowly sifting haze of green toned mist, which hangs just beneath the surface of these perfectly polished coasters. 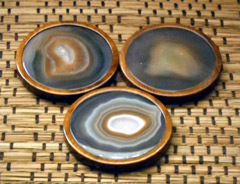 Brilliant amber visions appear in unqiue rings, creating exotic patterns right in the surface of each of these powerful and elegant agate beverage coasters. Lets yourself get lost, staring into the swirling bands, floating on a sea of hue which will drift you slowly in a circle until youve lost all sense of time and space. 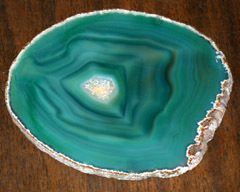 Beautiful and elegant gemstone home decor. Delightful pink and violet tones merge in rings and bands of unqiue color, giving the surface of these drink coasters a delightfully attractive appeal.